InLoox PM organizes your file or SharePoint server. In every project you have access to all related documents. Using the document folder path you can easily link a folder that is stored on your server to InLoox. Afterwards you can read in and update stored documents from that folder with just one click. The document folder path is only relevant for InLoox PM users, as documents of InLoox now! users are saved on the cloud. 1. Open an existing project. Open the Start tab and select Documents. The document list of your project will open. 2. Open the Settings tab in the document list and click on the folder icon. 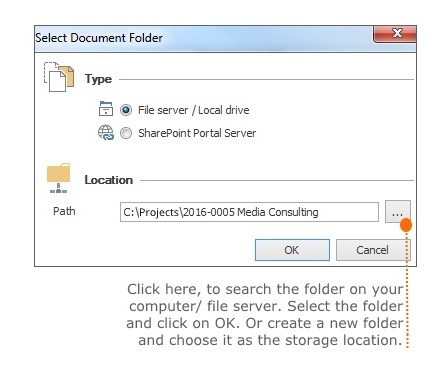 In the Type area choose File server/ Local Computer, when the folder is stored on your computer or on a file server. In the Type area choose SharePoint store, when you are working with a SharePoint server. Therefor the SharePoint needs to be defined as the default storage place for documents in the InLoox Options. 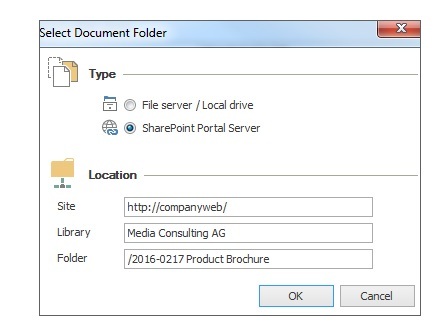 If the SharePoint is already defined as the default storage place for documents, all information about the location will be automatically displayed in the Location area. You just need to click on OK. For further information see Change the document folder path. 4. Open the Settings tab and click on Update Document List to read in all documents from the document folder. In the tree structure on the left side, the folder structure of the selected folder will be automatically displayed. Create the document folder path in InLoox PM • Copyright 1999-2019 © InLoox, Inc. All rights reserved.